In this video a "brim" is placed around a wind turbine and the power generated doubles. A simple static mechanism that doubles the efficiency of a turbine seems too good to be true. Is this a legitimate breakthrough? Additional links (but they all seem to be to non-primary-source articles) can be found by searching for "wind lens"
Yes, it appears to be significant and valid. Update: due to the questions below on scale, I have emailed the author of the paper, Dr. Yuji Ohya, to request his input on any potential issues with the increased size that will be required for industrial applications. Here is the email. I searched google scholar for the named professor in the video, Dr. Yuji Ohya (see his web page on the Kyushu University site). Searching for him there reveals that he is quite well published in areas of fluid mechanics and modeling/simulation. Ohya Y., Karasudani T. A Shrouded Wind Turbine Generating High Output Power with Wind-lens Technology. Energies. 2010; 3(4):634-649.. The full text is available for download at that link. Notable quotes from the text follow below. We have developed a new wind turbine system that consists of a diffuser shroud with a broad-ring brim at the exit periphery and a wind turbine inside it. 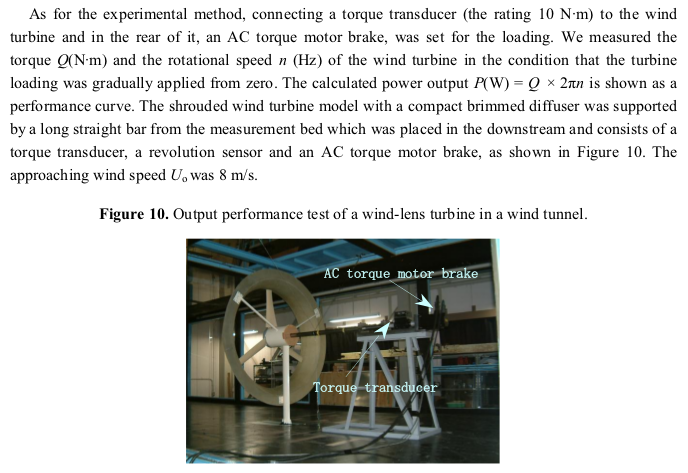 The shrouded wind turbine with a brimmed diffuser has demonstrated power augmentation by a factor of about 2–5 compared with a bare wind turbine, for a given turbine diameter and wind speed. This is because a low-pressure region, due to a strong vortex formation behind the broad brim, draws more mass flow to the wind turbine inside the diffuser shroud. (1) Four-fivefold increase in output power compared to conventional wind turbines due to concentration of the wind energy (“wind-lens” technology). 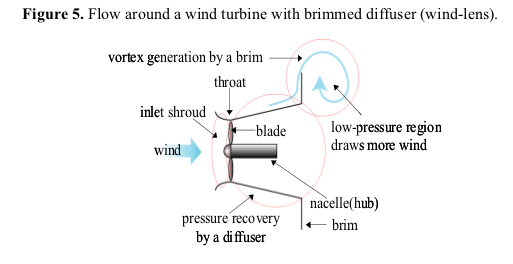 (2) Brim-based yaw control: The brim at the exit of the diffuser makes wind turbines equipped with a brimmed diffuser rotate following the change in the wind direction, like a weathercock. As a result, the wind turbine automatically turns to face the wind. (3) Significant reduction in wind turbine noise: Basically, an airfoil section of the turbine blade, which gives the best performance in a low-tip speed ratio range, is chosen. Since the vortices generated from the blade tips are considerably suppressed through the interference with the boundary layer within the diffuser shroud, the aerodynamic noise is reduced substantially. (4) Improved safety: The wind turbine, rotating at a high speed, is shrouded by a structure and is also safe against damage from broken blades. (5) As for demerits, wind load to a wind turbine and structural weight are increased. So, to conclude, it appears as though this is, indeed, valid research with documented results from actual experimentation. Regarding rebuttals, one may need to see if any appear citing this down the road. Honestly, though, as long as someone can replicate the trial, I don't see much to argue with -- it's power collected with and without the device. It either works or it doesn't. This technology is not new. Google "Wind Tamer" you will find a US company that implemented this type of funnel technology in the past. Stating an increase in efficiency due to the addition of a funnel is misleading. Efficiency is typically calculated based on the swept path of the turbine blades. 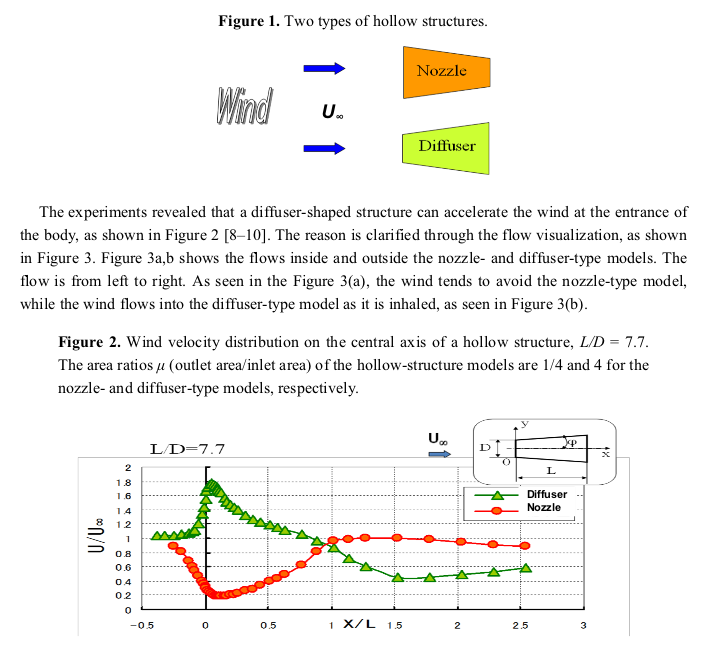 The funnel effectively increases the functional area exposed to the wind and should be included in the efficiency calculations. 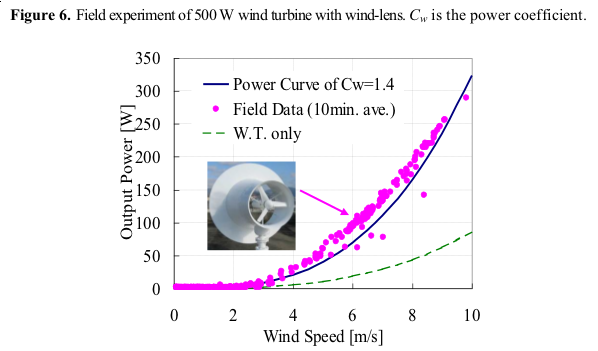 The "wind lens" increased efficiency is calculated by accounting for the additional energy captured by the wind lens without accounting for the additional swept area of the lens. When all is said and done the additional power output of a wind lens system could be duplicated by simply increasing the diameter of the wind turbine blades to match the outer diameter of the wind lens. Both scenarios accomplish the same thing which is increasing the wind turbine area exposed to oncoming wind. Not the answer you're looking for? Browse other questions tagged energy . Is Gasification of Garbage a Viable Energy Solution?